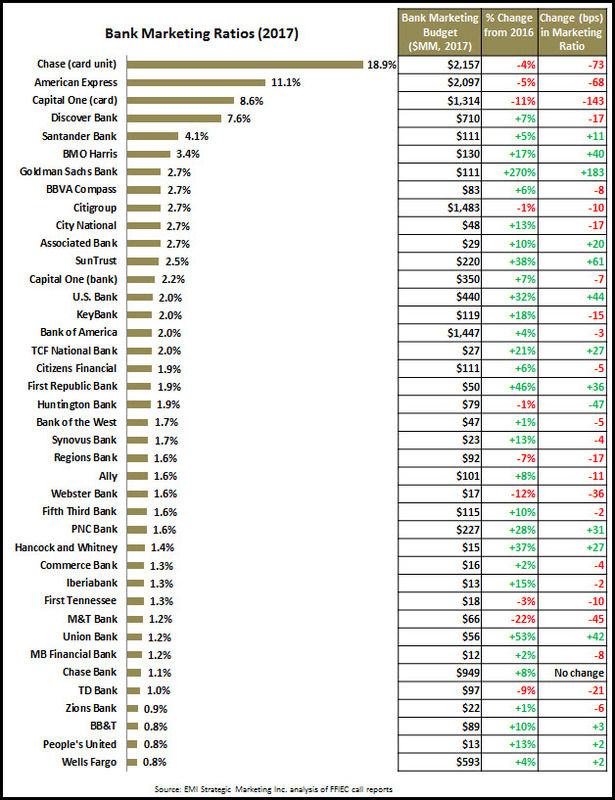 According to the FDIC, U.S. banks have been cutting branches steadily in recent years. 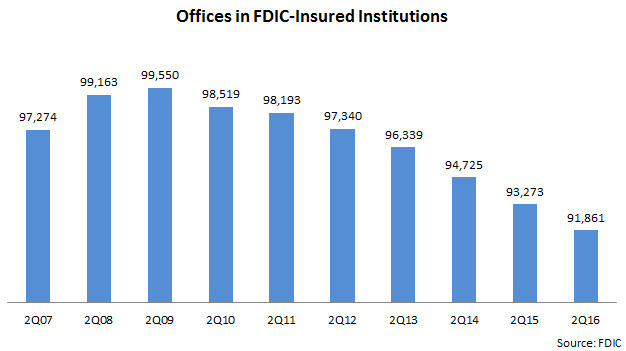 Offices in FDIC-insured institutions reached a high of 99,500 at the end of 2Q09, but have declined by almost 8% since then, to less than 92,000. Create specialist branches. Some banks are opening offices to target specific segments, such as commercial clients or high-net-worth individuals. For example, BMO Harris opened a commercial banking office in Dallas in June 2016, while Wells Fargo opened a Middle Market Banking office in Albany in August 2016. These branches are located, designed and staffed to cater to the characteristics and unique financial needs of these segments. Unlike traditional branches that tend to form part of a network, these specialists branches can operate on a standalone basis, thereby ensuring that costs stay under control. Use branches to promote digital services. Recognizing the transition to electronic channels for everyday banking transactions, banks can leverage their branch network to demonstrate the ease-of-use and value of these digital services to customers who are slow to embrace technology, while also showcasing innovations to early adopters of new technologies. Bank of America has deployed 3,800 ‘digital ambassadors’ in its branches who help customers understand and use its online and mobile banking services. Scale down the overall branch footprint. As they seek to reduce branch costs, banks need to take into account the benefits of having a physical presence in markets. This can involve using smaller branch formats (one extreme example is PNC’s portable 160-foot “Tiny Branch” on the West Virginia University’s Morganstown campus), reducing branch density, replacing a series of existing branches with one big flagship store, or even opening new branches in high-growth/high-potential markets. Decisions on the number, location and format of branches should be based on analyzing a number of key factors, including: competitive intensity; market size, growth and composition; current branch usage; short-term costs; and longer-term savings. C&I Loan Growth is Slowing; How Can Banks Maintain Momentum? The FDIC’s Quarterly Banking Profile reported this week that commercial and industrial (C&I) loans rose 7% between 2Q15 and 2Q16. This represents a decline from growth rates in 2Q15 (+8%) and 2Q14 (+9%). Identify and communicate key differentiators. Banks should gain insights from internal (salespeople, product staff, key executives) and external (current clients, suppliers, other partners) on what the bank’s key strengths and limitations are in serving commercial clients. Banks should combine this research with in-depth competitive analysis to identify key differentiators. These key differentiators then need to be consistently communicated across all communications channels. Identify and leverage opportunities in vertical industry sectors. Size and profile the opportunity: identify industry clusters within the bank’s footprint and/or sectors that have strong growth potential and that have traditionally been underserved by other banks. These sectors should be profiled to identify the key business and financial challenges of companies in this sector. Develop and implement a plan to target this sector, which may include establishing a dedicated industry group (First Tennessee Bank recently created a dedicated music industry group in Nashville), and engaging with this sector (e.g., by creating industry-specific content and collateral, as well as participating in, sponsoring and even hosting industry events). Develop thought leadership infrastructure and assets. Banks can develop a competitive advantage by creating compelling content in a mix of formats (reports, newsletters, infographics, blog posts, videos, surveys) and presenting this content in a consistent and visually-appealing format (e.g., using bullet points for quick scanning, images, callouts). Many leading banks have now created branded portals that provide content, tools and advice. Leverage captive channels and use non-traditional channels for communicating to prospects. Traditional B2B marketing channels are under pressure, as business readership of trade publications is falling and direct mail response rates continue to decline. Banks need to invest in a broader mix of marketing media, including online, email, social media and events. Banks also have significant opportunities to leverage their existing service (and sales) channels, including branch, call center, online, mobile and social media. Develop a commercial banking presence in non-traditional markets. Unlike retail banking, banks have more scope to develop their commercial banking operations outside their traditional footprint by opening beachhead offices in markets that have growth potential (overall or for specific industries) and where the bank feels it can compete effectively with incumbents. —Wells Fargo opened a commercial banking office in Portland, Maine. Although C&I loan growth has slowed, banks remain committed to continuing to grow their commercial loan portfolios. Banks that can clearly articulate and deliver their value proposition (and competitive differentiation) to their commercial clients and prospects will have increased their chances of success in this dynamic environment.